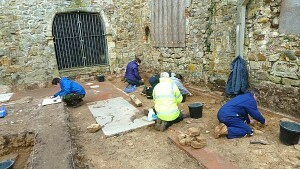 Conservation works to the ruins and the tower are due to start in May 2012, and this work will be preceded by a Community Archaeological Dig. The medieval church remains undisturbed below floor level and has high archaeological potential for understanding the Saxon and Norman church building. The Dig will be supervised by Chris Butler Archaeological Services Ltd.
An article in the Hastings Observer has generated huge interest in the dig and we have received over 120 applications to join the dig. These pages will be updated once we have received the report on the archaeological dig.